Please call for directions to our wheelchair accessible entrance. We are closed on Thanksgiving, Christmas, New Years, Easter and July 4th. We accept cash, debit, Visa, MasterCard and Discover. 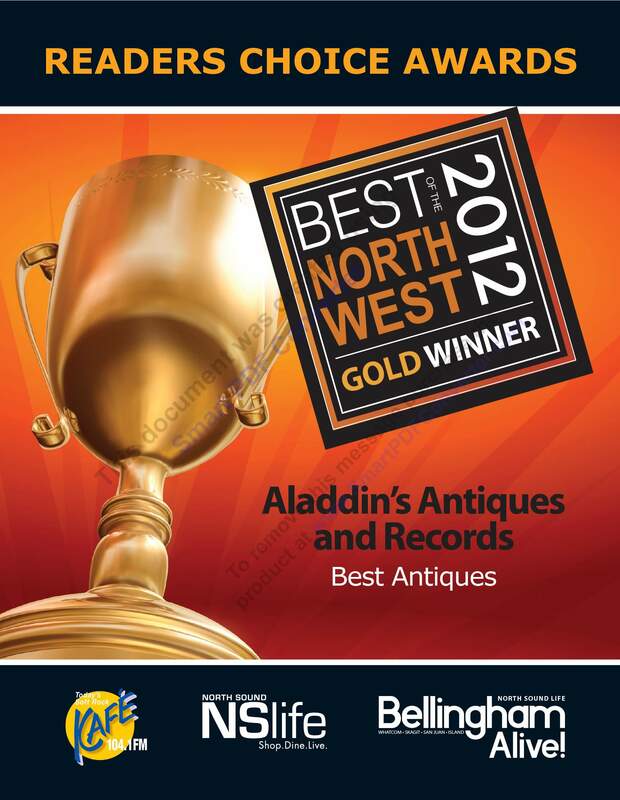 Established in 1984, Aladdin’s has been acquiring and selling a distinctive assortment of antiques and collectibles. Aladdin's is a destination point of interest along I-5 between Seattle and Vancouver British Columbia. Since we are a large Antique Mall with two entire stores: Penny Lane and Aladdin's Antiques and Records, there are multiple vendors contributing to the inventory. That means a large variety of merchandise that changes daily. There is always something for everyone, every age and every budget. You may find a Dukes of Hazard lunch box or an Eisenberg brooch. Possibly a 100 lb anvil or a lovely vintage fountain pen. Keep us in mind when you are looking for a gift for that person that has "everything" or when you are working on an interior or exterior design project. Artists have a great time here gathering inspiration and components for art pieces. Also, don't forget, we have gift certificates. At Aladdin’s you can find treasures from hand-picked vintage and estate jewelry and art to home decor and furniture. We feature pieces from the Arts and Crafts, Mission, and Mid-Century Modern periods. Art pottery, art glass, cast iron and tin toys, Star Wars and other movie collectibles, plus radio and television memorabilia. Items frequently found in our store: Select and Estate Jewelry, Photography Equipment and Photos, Advertising, Vintage Magazines, Art Glass, Art Pottery, Household Accessories, Depression Glass, Kitchen Wares, Furniture, 20th Century Pop Culture, Guitars and Amps, Other Select Musical instruments, Vintage Radios, Vintage Tools, Vintage Toys, Star Trek, Star Wars, Hi-Fi and Stereo Equipment, Phonographs, Vinyl Records; 45's, 33's, 78's. Rare Beatles and Elvis. Edison Records, Cylinder Records, Cassettes, 8-Tracks, Reel to Reel tapes and more! Why buy antique and used? Because of the quality, artistic value, historical significance AND because we are recycling! Antiques and collectibles that were created both here in the US and around the world, offer unique designs and durability that pale in comparison to today’s imports. We are changing from plastic merchandise bags to paper. We encourage our customers to bring reusable shopping bags. Keeping the plastic out of the oceans is of utmost importance. Copyright © Aladdin's Antiques and Records. All rights reserved.